Hilton Playa del Carmen (formerly The Royal Playa del Carmen) is an all-inclusive, adults-only (18+) resort in beautiful Riviera Maya. This luxurious resort offers guests a blend of exceptional personal service and an array of facilities, coupled with an outstanding beachfront location in the heart of Playa del Carmen. Please Note: The Royal Playa del Carmen will transition to a Hilton hotel as of November 1, 2018. See more info under the Hotel Updates section below! Totally redesigned and redefined for the ultimate luxury escape for adults-only (18+)! 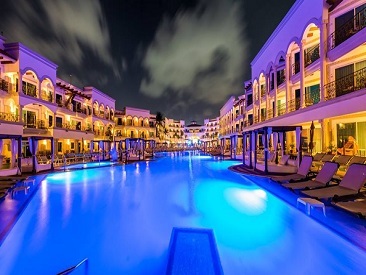 The Hilton Playa del Carmen, an All-Inclusive Resort is a AAA Four-Diamond resort offering guests a blend of exceptional personal service and superb all-inclusive facilities coupled with an outstanding beachfront location in the heart of Playa del Carmen. 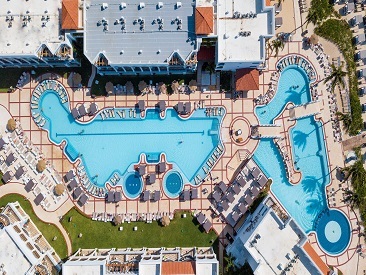 The resort offers stylishly oversized suites, an array of gourmet dining options, a variety of bars and lounges, a magnificent freeform swimming pool complex, 24-hour room service and SPAzul, a world-class spa offering a fusion of traditional and extraordinary Mayan-inspired treatments. The resort caters to discerning adults (18+) looking for an exceptional and relaxing, all-inclusive luxury vacation experience. Plus a host of day and night time activities including theme parties and outstanding live entertainment is available for guests each evening. The ultra-luxurious SPAzul offers a full range of Mayan-inspired signature spa services including facials, body treatments and massage therapies in six elegantly appointed treatment rooms. Inviting hydrotherapy areas for men and women, a relaxation garden with a traditional Temazcal steam hut and Polish waterfall massage and a full-service unisex beauty salon are also available. All treatments and spa and beauty services are at an additional cost. A complimentary fitness center with the latest in exercise equipment and weight room facilities is available. Hilton Playa del Carmen, an All-Inclusive Resort's ideal location offers guests the thrill of being on one of the best beaches in the area while simultaneously being right in the heart of chic Playa del Carmen. It's just a short walk to Fifth Avenue, the famous pedestrian thoroughfare, where you'll find fabulous art galleries, jewelry and silver shops, Mexican handicrafts of all kinds, clothes and shoes, not to mention bars, restaurants and lively clubs and discos! You just couldn't ask for a better combination...incredible private beach and ROYAL accommodations close to all the fun and excitement of Playa del Carmen. 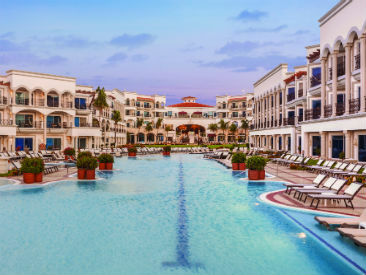 Guests of Hilton Playa del Carmen, an All-Inclusive Resort enjoy full access to the facilities and restaurants at the three Real Resorts properties in Playa del Carmen. Gran Porto Resort is conveniently located just next door. Please note that Hilton Playa del Carmen, an All-Inclusive Resort is an Adults-Only hotel catering to adults (18+). However, the adjacent Gran Porto Resort is an ideal vacation choice for families with a very active and well-organized Oki Kids Club on-site and a loving and competent team of activity coordinators that make every day special for the little ones! Book at least a 3-night stay in a Royal Junior Suite or higher and receive a 50% discount for unlimited all-inclusive golf! See ‘Activities’ tab for more details. Major Hotel Updates and Renovations! The Hilton Playa del Carmen will undergo a renovation project commencing February 15, 2019 and is scheduled to be completed by December 19, 2019. Minimum impact to resort guests is anticipated during the phased renovations due to the size of the resort. Restaurants will remain open and operating during renovations and will only be closed when necessary. Each phase will include a section of rooms that will undergo renovations. El Mediterraneano and Coffee shop located in this area will be closed during the upcoming renovation project. Guests are welcome to use Barefoot in the morning as well as the 24-hour outlet for coffee options. By the end of February a NEW Coffee Shop will open. Maria Marie restaurant will be open for breakfast buffet; El Mediterraneano for lunch buffet (evening will continue to offer a-la-carte menu). Barefoot will also offer more lunch options during this period. Please Note: Adults 18 and up are the only guests allowed on property.